The Spectrum Eye Centre Life is a visual experience...We have a passion for enhancing it. The Humphrey Matrix represents the latest breakthrough in visual field testing. Visual field testing is critical for treating and managing patients with glaucoma and other peripheral vision deficits. The Matrix Perimeter utilizes Welch Allyn Frequency Doubling Technology. It represents a significant breakthrough in visual field testing by combining early glaucoma detection capabilities, tools to characterize glaucoma and basic glaucoma management tools. 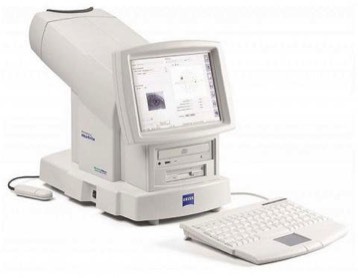 The Humphrey Matrix Perimeter comes equipped with Glaucoma Hemifield Test and serial field overview software for comprehensive threshold exams and charting change over time. Matrix clinical validation is assured by a large, age-related normative database. Compared to other visual field instruments the Matrix is extremely user friendly for you the patient. The Matrix Perimeter's utilizes video eye monitoring to simplify your eye alignment and fixation control. With the Matrix, an eye patch isn't necessary when conducting the visual field analysis. The Matrix performs dependably in ambient light so there's no need to darken the room. Matrix test results are viewed on-screen with the LCD color display and can be printed on an external color printer. Storage capacity holds up to a million exams for historical analysis. 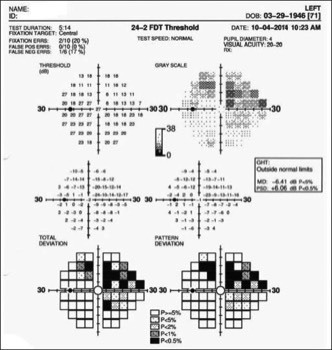 Visual field testing is an important tool in the diagnosis and management of glaucoma. It is used to confirm that glaucoma has affected the visual function, to evaluate the severity and to monitor progression of the disease. The Humphrey Field Analyzer II is a wheelchair accessible, diagnostic tool used to examine a patient's visual field. 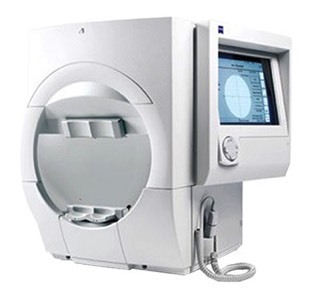 The Humphrey Field Analyzer II is the recognized standard of care for early diagnosis and management of ocular diseases resulting in visual field loss. • Diagnostic Precision: the Humphrey Field Analyzer II has been shown to be extremely accurate. • Early Glaucoma Detection: this technology has been shown to provide earlier detection of vision loss due to glaucoma. • Quickness: the Humphrey Field Anazlyzer II measures visual fields in as little as two minutes.